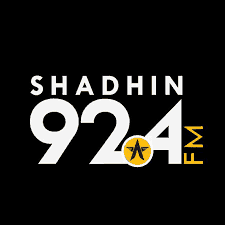 Radio Shadhin 92.4 FM Live Streaming Online . Listen over 50 Bangla FM Radio Stations online . Enjoy Live Stream of bangla Music online 24 by 7 . If FM is not playing see the right Corner of the HomePage Sidebar to know what all software needed to listen the Fm.Refresh the page once if FM is not playing. Shadhin is an infotainment based radio, giving emphasis on the impact of current affairs on our society. This FM is a concern of Asiatic 360. It began rudimentary test transmission during September 2012, followed by commercial launch during March 2013, and now it can be heard at this very moment by the population of approximately 15 million that reside in and around Dhaka, Bangladesh, and growing every day. Address : Asiatic Centre, House 63, Road 7B, Block H, Banani, Dhaka 1213.